bon voyage, a new mural believed to be the longest in New Zealand, is visible both to locals and train-line passengers as they enter and depart Christchurch. 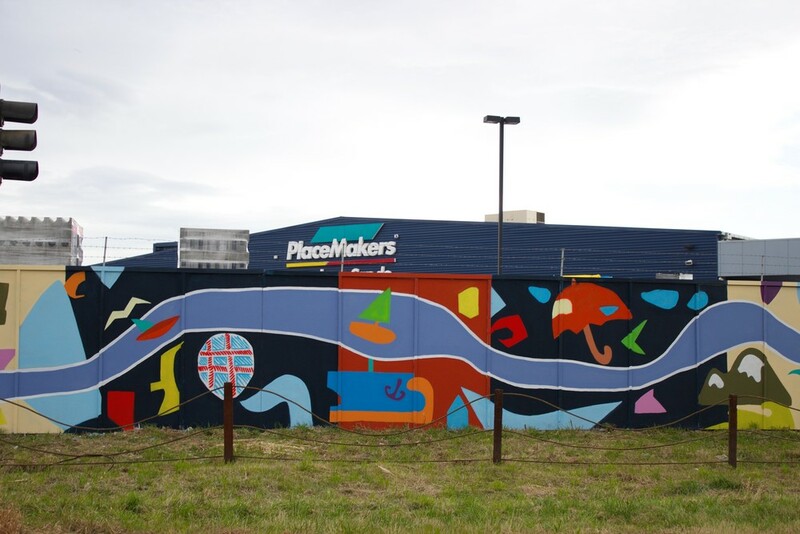 Approximately 205 metres long, the artwork has been created by Rachael Dewhirst from a commission by PlaceMakers Riccarton, and, appropriately, is painted (by Tobin Bain-Hogg of StreetSeen) on the border fence of the store’s site. As its title suggests, bon voyage is a positive ‘well-wish’ for a journey and a true arts and industry collaboration. bon voyage is Rachael's second public artwork produced by SCAPE Public Art. bon voyage encapsulates both the artist’s and commissioner’s desire to bestow well wishes to the city and people. Rachael has considered the experience of the mural from passing trains. The river is a reference to the Ōtākaro, the Avon River of Christchurch. It is used as a rhythmical pulse that weaves its way through the design like a heartbeat tying the different pieces together. Figurative silhouettes and block forms can be seen, some distinguishable as animals, boats, landscapes and parts of architectural forms. Other elements are more abstract with the intention of leaving the work open to interpretation and imagination of individual viewers. In her painterly response to the subjects and narratives of her work, Rachael Dewhirst’s paintings touch upon both formal aspects of painting and the immediate experience of the world around her. Dewhirst works in a range of media, applying paint in impasto and translucent washes. Just as the application of paint to the canvas demonstrates a joy and pleasure in the act of painting, the subjects of Dewhirst’s work are equally characterized by their optimism. Dewhirst completed BFA Honours in Fine Arts in 2013 at the University of Canterbury, and has work in the collections of the James Wallace Trust and University of Canterbury. Born in Auckland, New Zealand (1991), previously completed Honours in Fine Arts (2013) at the University of Canterbury, New Zealand.